My daughters request a horseback trail ride on every vacation. This place was reasonable, very accomodating, and where some have cut 15-20 minutes from a 2 hour ride, this day we had 15-20 minutes extra! We had some experience so we got to trot and even canter a bit. The guide was young and quite quiet, but gave a nice ride through meadows and wooded trails. The horses were trained, but they did keep us “on our toes”. We have had rides where you could fall asleep and the horse would do the trail just fine. 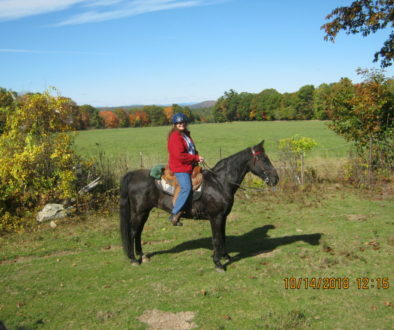 we had to keep the horses from stopping or wandering, which makes the ride more exciting and a bit scary (my horse tried to kick me as I approached him at first and kept fighting at the bit in his mouth) Beautiful landscape anytime, but especially as the trees changed color in the fall. Compared to out rides in Denali area in Alaska, Lake Eire, Black Hills, this ranks right up there with the best.